New Right Chairman says AG decision on Netanyahu cases important, but he doesn't have power to harm democratic election process. 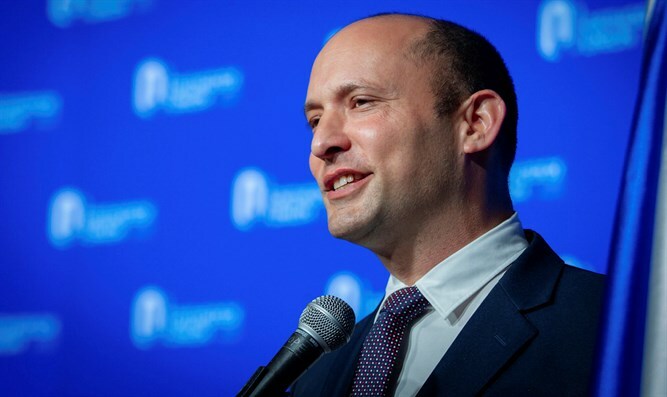 New Right party Chairman Naftali Bennett addressed the possibility of a decision to indict the Prime Minister even before the elections. "By the time there's a hearing against Netanyahu, if it happens, we'll think of what to do. It's inappropriate for one man to replace a government. Worthy as he may be, Mandelblit cannot change the government, but rather decide to indict or not to indict. In the political field, they'll decide what to do based on the decision of one person," Bennett said at the Institute for National Security Studies. "A lot of senior officials' cases ended in nothing. Millions of Israelis will shape the situation with a vote, and then with all due respect to all the jurists, the millions should be allowed to express their position on who leads the State of Israel, otherwise we'll just pass it on to the judicial system to decide who'll be in power. The public will take everything into account and decide who to vote for," added Bennett.